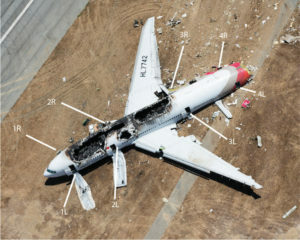 In the chaos of the crash landing and emergency evacuation of Asiana 214 at San Francisco International Airport on July 6, 2013, 186 people were hurt and two died from injuries sustained in the accident (a third traveler was run over by first responders at the site). But remarkably 106 people were physically unharmed. From the sight of the wreckage – a blackened hulk missing its decoupled tail section and a spray of debris – that may have seemed a miracle to many. 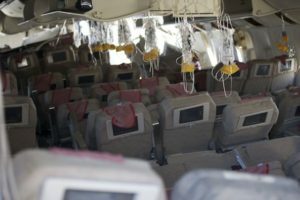 But this accident is the latest example of how past air disasters have created safer cabin interiors that are helping to save lives now. The nine-year-old Boeing 777 on approach to runway 28L was flying at over 100kts when the main landing gear struck the sea wall just before the runway. The rear fuselage separated and the rest of the aircraft continued on – becoming airborne briefly as it rotated 330°. Then the belly of the aircraft slammed onto the ground. Cabin structures including seats, overhead bins, galleys and lavatories experienced g-forces in excess of that for which they were designed and in some cases the structures failed, but still offered protection to the occupants in the cabin and cockpit. “This aircraft did exactly what designers want it to do. In the case of a survivable hard landing, the fuselage and the seating systems worked together to absorb the impact energy,” says Robert Salzar, principal scientist at the Center for Applied Biomechanics at the University of Virginia. Practically everything that goes into an airliner cabin is analyzed to see how it will interact with occupants in an impact situation. These include the seats, the seat-to-floor attachments and the seat restraints, the overhead bins and side panels. Other components must help provide rapid escape. Those would be the evacuation slides, doors and emergency exit windows, floor lighting and the materials that will slow the spread of smoke and fire. When Dan Freeman, director of payloads engineering for Boeing, was asked what components inside the cabin had to be certified for safety, he said “everything”. 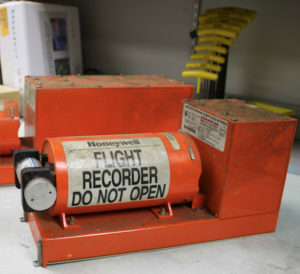 In a presentation on 11 December 2013 at the National Transportation Safety Board’s (NTSB) hearing into the crash, Boeing’s evacuation systems engineer, Bruce Wallace, told investigators, despite “multiple severe impacts” the passenger seats and belts provided protection, while the cabin structure maintained enough integrity that the “overhead stow bins did not fall on the passengers or impede evacuation”. 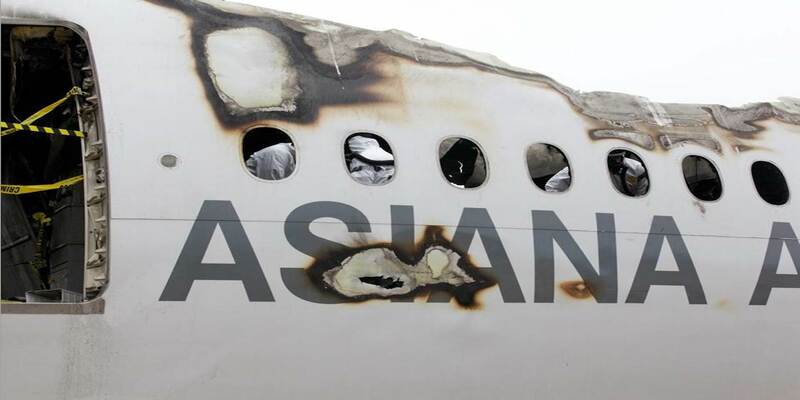 When Asiana 214 finally came to a stop, senior flight attendant, Tae Sik Yoo saw the fire outside the second door on the right side of the aircraft. He ordered an evacuation even before the cockpit crew and flight services manager realized the danger. “I thought to myself, the crew does not know what is happening in the rear of the aircraft,” Yoo wrote in his statement to the investigators. According to his report, he made two emergency announcements and started the evacuation. This was not without problems, though. At two doors on the right side of the cabin, the evacuation slides had inflated during the second impact, trapping the two flight attendants whose jump seats were near those doors and making those escape routes inoperable. Passengers and crew fled through the remaining five doors and from the hole in the back where the tail had been. While many people got off quickly, some debilitated passengers remained inside where smoke was beginning to fill the cabin. Still, as Boeing’s Wallace pointed out at the hearing, “Smoke or fire did not prevent complete evacuation of the aeroplane.” The way the B777 performed “highlights the benefits of the aviation industry’s work to increase aeroplane safety and survivability”, Wallace concluded. 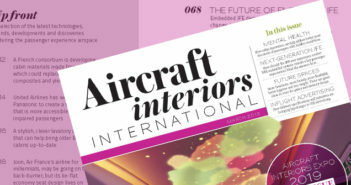 The biggest advances in cabin safety – stronger seats and fire-retardant cabin materials – came about in the 1980s when seat manufacturers were required to work on the impact a seat could withstand and remain intact, and increase it from nine times the force of gravity to 16 times. Around the same time, several accidents in which passengers survived an accident but died from the resulting fire prompted rules about what kinds of materials can be used in the cabin. These changes are responsible for a notable decline in the proportion of fatalities to air accidents over the past three decades, said Freeman. The NTSB declined requests for interviews, but people familiar with the process say that, as the agency continues to probe what happened, those in the Survival Factors group will examine the damaged interior and review the experiences of the flight and cabin crew and passengers. 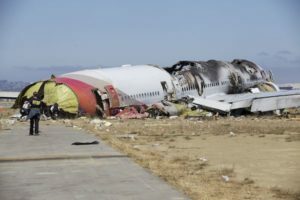 They may be hampered by the damage in business class and the forward section of economy, some of which was the result of the post-crash fire and firefighting efforts. Still, close scrutiny is already being given to the kinds of impact damage seen on the seats throughout the aircraft. What the NTSB learns about how the seats performed will be compared to the passenger injuries. The business seats were equipped with shoulder harnesses, because unlike the seats in economy, where passengers have the seatback of the seat in front of them to cushion their head, larger premium seats don’t have proximity to another seatback. Protecting the head in a sudden stop is an important component to survivability. In an abrupt deceleration, “the brain also starts moving, so inside your skull the Jell-O is moving and getting impacted”. Seat designers must use either seats or seat restraints to protect the head. “The passenger should be able to unbuckle, get up and walk out,” Islam said. 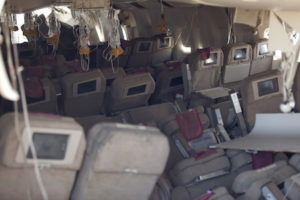 Seats were most damaged in the C section of the passenger cabin. From row 36 and beyond, there were several instances in which supports were broken and seat rows were knocked down so that the backs were facing the ceiling. In one instance, a seatback was reclined onto another. “In a 16g crash test, it should not do that,” says Tom Plant, vice president and general manager of B/E Aerospace, a seat manufacturer whose products were not on the Asiana B777. When a seat or seat row falls onto another, it can cause serious injuries, obstruct evacuation or trap passengers. A flight attendant on the Asiana flight reported that a woman seated in 42E was stuck in her seat until a man “kicked and punched the seat, breaking it forward so the woman could get out”. Even then, the woman’s leg injury made her unable to move on her own, the attendant reported. The 16g tests are designed to ensure that the seat stays attached to the aircraft structure, Plant explains, and in many cases that goal was successful. Another certification test confirms that the seatback will not break forward. It should cushion a body that may flail forward on impact. While the accident is seen by many as confirmation that increased safety standards for cabin interiors are working, because passengers were protected during events greater than anticipated by the certification standards, at the same time, a number of things went wrong that could have had dire consequences; for example, two of the escape slides opened into the cabin interior, disabling doors and trapping two flight attendants. 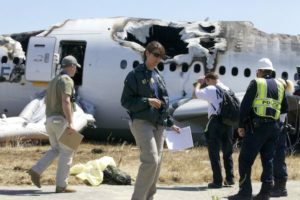 Parties to an NTSB investigation are limited as to what they can discuss while the probe is ongoing and phone calls and emails requesting comment from Air Cruisers, the manufacturer of the escape slides, and its parent company Zodiac, went unanswered. The NTSB report says the slide release mechanism failed. Tests performed in November 2013 intended to discover what amount of pressure would cause such failure showed that between 1,465.8-1,766.4 lb of force could cause the release mechanism to give way. This information will help investigators understand the size of the multiple impacts, and could conceivably result in reconsideration of the certification standard. Other companies whose products were on board Asiana flight 214 may review their designs in light of what happened. Investigators are trying to determine how much was stowed in the overhead bins, which are certified to a maximum of between 75 lb and 85 lb on the Boeing 777. It’s not just products that are being examined. Passenger and flight crew behaviour can also affect survivability. It is suspected that not all the travellers were wearing seatbelts during landing because the belt at seat 42B was found fastened. That seat and 42A were positioned in the doorway of the number 4 left-side door. The probe will try to discover if one or more unrestrained passengers were jettisoned from the aircraft. Some people also retrieved their carry-ons before evacuating, according to reports by passengers and flight attendants filed with the NTSB. Flight attendant Han Woo Lee told investigators that she saw 10 to 12 people in a group “trying to get their bags out of the overhead bins”. Following an accident, investigators look for ways to better protect people on board. The machine is only part of the equation; the experiences of both the passengers and flight crew can also provide clues as to how to make flying safer.